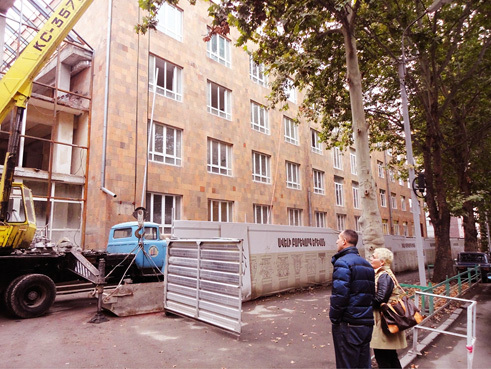 Tremendous progress has been made, yet continued support is critical, in the on-going reconstruction of the legendary Tchaikovsky Music School in Yerevan, Armenia. December 14, 2015, New York, NY — Last month, Lisa Stepanian, Executive Director of Armenia Fund USA, returned from a trip to Yerevan where she reviewed first-hand the progress on this project. The following is her interview with Vartan Abdo, Director of the Armenian Radio Hour of NJ. VA: What is the importance of the Tchaikovsky Music School in terms of classical music education in Armenia? LS: Since 1939, the Tchaikovsky Music School has cultivated generations of prodigies, virtuosos, maestros, and composers. Over 70% of the students attending the prestigious Komitas State Conservatory in Yerevan are graduates of the Tchaikovsky Music School. Its influence on the classical music world reaches far beyond the borders of Armenia. Many past and living Armenian musicians, who are alumni of the school, have enjoyed critical acclaim in esteemed orchestras and prestigious conservatories in Europe and the West. November, 2015 (Yerevan): Lisa Stepanian (Armenia Fund USA Executive Director) and Ararat Khlghatyan (Deputy Director of Construction) review the progress on the Tchaikovsky Music School reconstruction project. VA: We understand that this project is divided into two phases. Would you describe the goals of each? LS: The goal of Phase One is the complete overhaul of the school’s physical infrastructure. Since the work began in March 2015, we are focused on building a school that will educate young talented Armenians for many generations to come. The current focus of all our fundraising efforts is on the completion of this contemporary, state-of-the-art educational facility. The goal of the second part of our project, Phase Two, is the implementation of an IT infrastructure in the facility and establishing relationships with master class instructors, guest lecturers, and student mentors from around the world. VA: What progress has been made in the reconstruction since your visit last spring? LS: Major progress has been made in some of the most important structural components of the project. Specifically, the frame work, flooring, and roof work have been completed. A new ventilation system has been installed. The elevator will soon be installed, providing greater accessibility to the entire building. 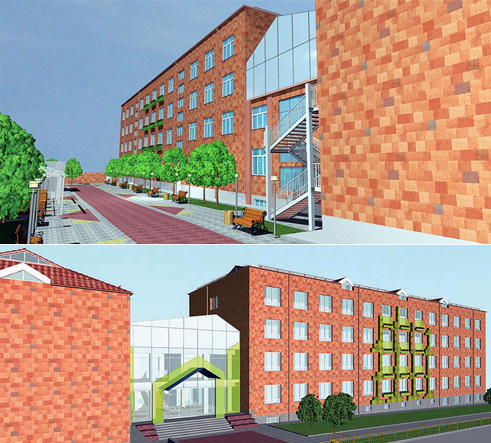 Artist renderings of the rear (above) and front (bottom) of the completed Tchaikovsky Music School, due to be completed in September, 2016. Great strides have also been made in some of the interior features. All new windows and doors have been installed. The walls are covered with sheetrock and ready for painting. The gymnasium’s cement floor has been laid and is ready for further finishing. On-going work is being done to ensure a thoroughly modern facility, including: earthquake-proof construction, fire alarm and internal video surveillance systems, a renovated internal water supply systems, and interior furnishings. 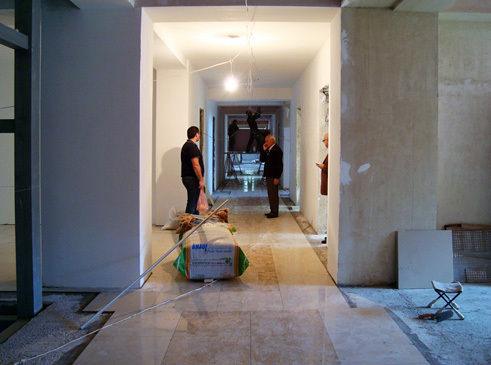 November, 2015 (Yerevan): Workers completing interior finishing of flooring and walls. VA: The construction team has certainly made great strides. What percentage of the work has been completed? LS: Approximately 40% of the reconstruction work has been completed. However, we still have a critical need for financial support so that this work can continue to its completion in September, 2016. This deadline has been set such that the 2016-2017 school year may begin in this modern facility. VA: What sponsorship opportunities are still available to individuals or families that would like to support this project? LS: The sponsorship opportunities are as broad and varied as the institution itself. The school has approximately 600 students, ranging from ages 6 to 18. It has a full academic curriculum, as well as its famous specialized music program. Sponsors may match their interests to specific needs within this project. Naming opportunities include: classrooms, recital halls, grand concert hall, and a gymnasium. In addition to these naming opportunities, we are also grateful for contributions in any amount. VA: Alumni of the school have been very supportive of this project. What message do they have for current and potential supporters of this project? Tchaikovsky Music School played an important role in my life. It is part of the reason that I started playing the cello and discovered my love for music. It was not an easy journey. However, I am thankful for the knowledge, time, and effort that the teachers invested in me. The Tchaikovsky music school provided me with a strong foundation that gave me the opportunity to continue my musical education at Komitas State Conservatory and later at The Juilliard School. Tchaikovsky Music School was an essential foundation for me; not only as a musician, but also as an Armenian artist. It fostered my appreciation for music education, art, culture, and the traditions of Armenia. Students in schools designed for the gifted and talented face fierce competition from a very early age. However, within its supportive and friendly atmosphere, Tchaikovsky Music School shapes strong, competitive, respectful, appreciative, and confident musicians who feel comfortable performing on stage and teaching in their respective fields. Tchaikovsky Music School, with its wonderful teachers and students, will always remain in my heart as my very first and dear alma mater. Supporting this project now will ensure that this legacy of excellence in musical education will continue long into the future. When you join us in supporting the future of the Tchaikovsky Music School, you will know that hundreds, if not thousands, of students will be prepared to succeed in the 21st century on a world stage. ABOUT: ARMENIA FUND USA is dedicated to supporting large-scale, self-sustaining initiatives with the greatest potential for a brighter future for Armenia, including Karabakh, as they continue to undergo social and political transition. The Fund is primarily focused on sustainable physical infrastructure for the region and humanitarian and economic development for communities, families, and individuals. 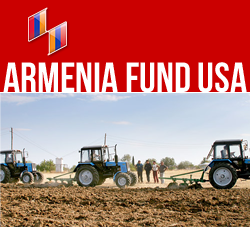 Armenia Fund USA is a non-profit 501(c)(3) organization under U.S. law. All donations are 100% tax-deductible.